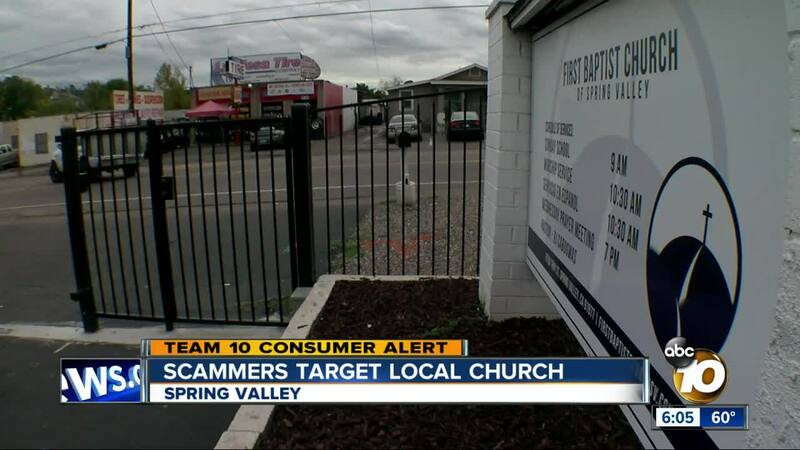 A Spring Valley church says scammers pretending to be from SDG&amp;E targeted it. The Pastor at First Baptist Church in Spring Valley says the caller told him they didn’t pay the power bill. SAN DIEGO (KGTV) — A Spring Valley church says scammers pretending to be from SDG&E targeted it. The Pastor at First Baptist Church in Spring Valley says the caller told him they didn’t pay the power bill. “There was an unverifiable payment for the last three months," said First Baptist Church of Spring Valley Pastor RJ CAbugwas. Cabugwas tells 10News he received multiple calls and voicemails from what he thought was a 1-800 number to SDGE. When finally returned the call he says the person on the other end told if he didn’t pay up the power would be shut off. "Within the next 30 minutes if you are not going to make payment we are going to shut off your electricity,” he said. Cabugwas says the only way to solve the problem was told to get three gift cards each worth $500. It sounded odd, but the caller claimed a dispatcher was waiting to shut off the power. Cabugwas says he saw an unmarked vehicle out front of the church. "It's on a Saturday and Sunday we have services, and we can't afford not to have electricity during these times,” he said. It wasn’t until after services the next day he realized he’d been scammed. The company has set up a website on how to spot scams.